World leaders will come together in Lima, Peru this December for the UN Climate Change – an agreement that we hope will then be finalized in Paris in 2015. These leaders need to know that we're holding their work in our thoughts, meditations and prayers. As citizens of the so-called First World, we recognize our responsibility for having despoiled and destabilized the global climate. We recognize our moral responsibility to do everything we can to reverse the worst effects of our society’s wastefulness, and to work to restore creation. We also recognize our special responsibility to our brothers and sisters the world over who are already dealing with the devastating impacts of climate destabilization. We can make a difference. As humanity finally begins to grapple with this existential crisis, we must ensure that our actions are grounded in respect for the natural environment, a passion for justice for the vulnerable, and a deep love for one another. With our lights we can guide the way. Sponsored by: Baha’i Faith; Concerned Families of Westchester; Great Company (a GreenFaith Circle); InterFaith Connection; InterGenerate; ROAR (Religious Organizations Along the River); Roots & Wings, the sustainable initiative of South Church Dobbs Ferry; Sisters of Charity New York; Sisters of the Divine Compassion; Stop the Algonquin Pipeline Expansion; and White Plains Presbyterian Church. For more information search Westchester #LightForLima Vigil on Facebook. For questions please contact Great Company at kathydean64@gmail.com . I snuck out of the house before anyone was awake, and wheeled my bike silently out of the shed. Going to my first CSA pick-up felt like a little adventure. Twenty minutes later I arrived at the Main Street School, in Irvington. What does a CSA even look like, I wondered. 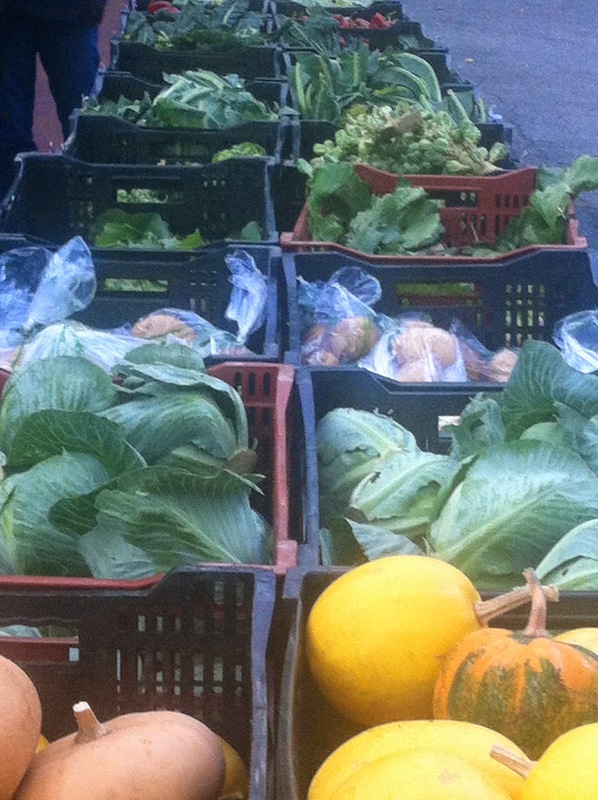 Then, behind about two dozen cars I saw a very mini farmer’s market. I told the woman with a clipboard my name, and then followed others, shopping as the signs directed. “One bunch.” “3 fruits.” “2 bags.” I didn't even need to get out my wallet. 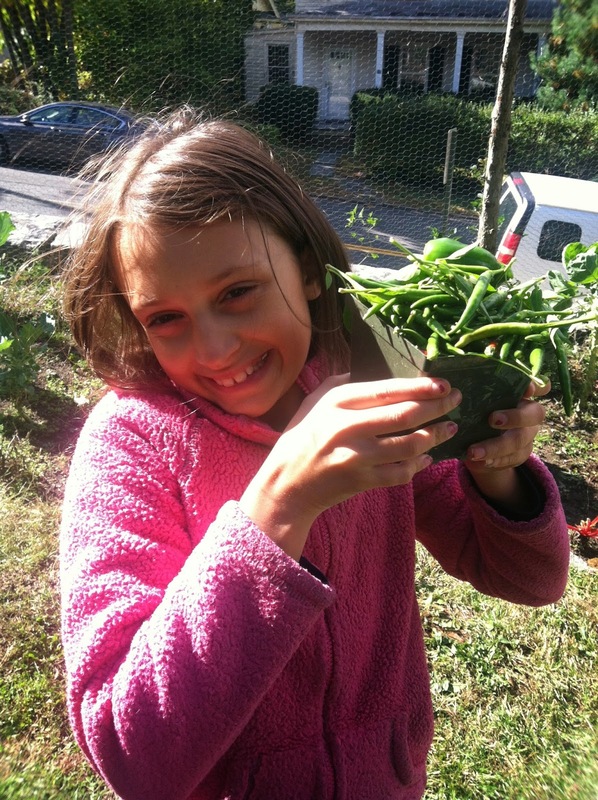 CSA stands for community supported agriculture, which means that people prepurchase a portion of a farm’s harvest. Northeast OrganicFarming Organization says CSAs emerged in Japan and Europe in the 1960’s, driven by consumers who wanted quality food and to support sustainable agricultural practices. It arrived in the US in the mid 1980s. 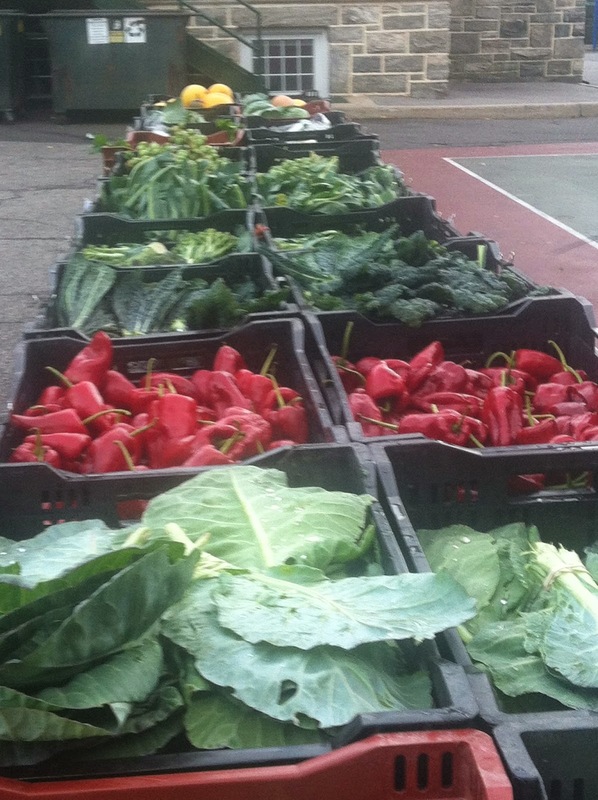 Local Harvest estimates that there are now 4000 CSAs in the US. All of the produce I picked up was grown on Rexcroft Farm, in Greene County, near the Rip Van Winkle Bridge. It was picked within the last few days, and driven by the farm’s owner, Dan King, to two central meeting places, where volunteers distribute it to approximately 200 members from the Rivertowns as well as far away as White Plains and Yonkers. 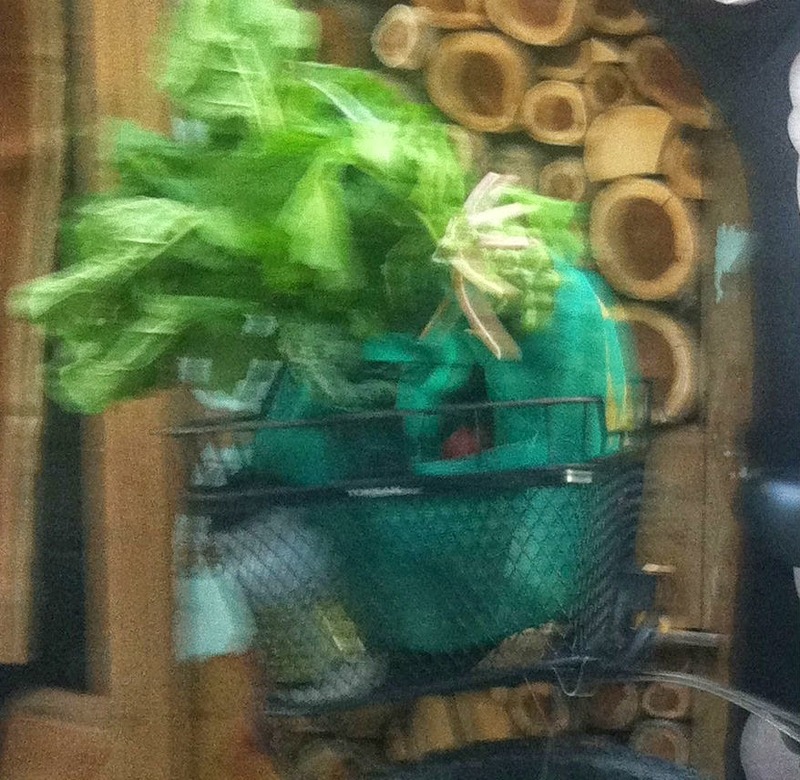 Later that morning I rolled back onto our patio, lifted the green grocers bag out of my back-of-bike basket, and carried it into the kitchen. My daughters, now awake and sensing breakfast, gathered round. I reached in to display our farm fresh food. But, what was this orange goo on my parslane? I opened the bag and saw small smashed heirloom tomatoes everywhere, like sticky popcorn on the floor of a movie multiplex. The peaches, however, nestled against the red-leaf amaranth, were intact. So were the half-dozen pullet eggs. My mistake was packing my grocery bag the same way I always did, when it just had to travel from cart to car trunk to kitchen. It had been so fun biking home, bouncing on the Aqueduct’s root bumps past joggers and dog walkers, I didn’t give my cargo a second thought. Rexcroft Farm CSA member for five years, notes, “Besides having incredibly fresh vegetables, we have learned to love kohlrabi which we had never tried before. Many new recipes have become favorites, Macaroni and Cheese with Spinach, Cabbage and Mushrooms and Cauliflower Kale Pie to name a few." My family had eased into the CSA with the lowest commitment level, the 15-week half share of vegetables and fruit for $347.50, because I wasn’t sure if it would be a good value. But the fact that the Old Croton Aqueduct connects my home in Dobbs Ferry to the pick up site, at the Main Street School, in Irvington, sealed the deal. 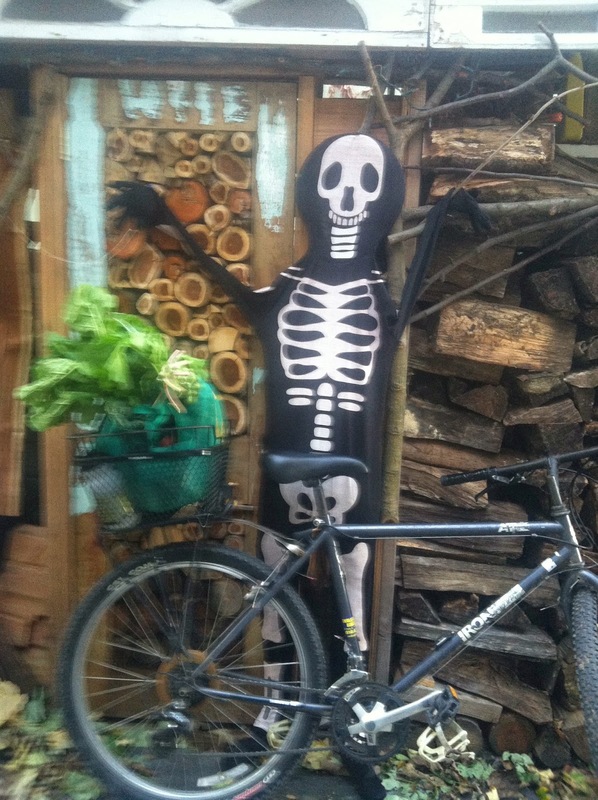 Even if I was paying farmers market prices for the produce, I reasoned, I could bike there. I’d get some exercise and good food and add absolutely nothing to my carbon footprint. Now, I’d say it was the best $23.16 I spent each week. Dale Williams, who, with Betsy Anderson, was the other part of our first-time half-share, lists his top three CSA highlights: the fresh food, the local connection, and the camaraderie at the pickup. 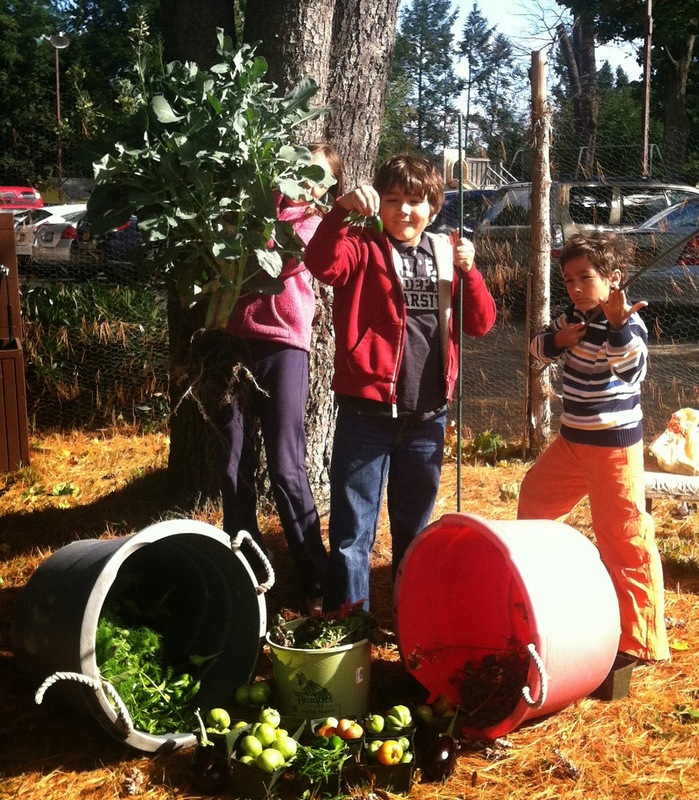 during church school to gather the last harvest for the Dobbs Ferry Food Pantry. At midday, an infusion of adults came, pulled up the last of the plants and made a big compost pile, and planted a cover crop. Here's a peek at the day, and at the cover crop that has emerged. The cover crop for the winter. This planting will winter kill giving a nice underground biomass, decaying organic nitrogen fix in the spring and a perfect ground cover to plant into in the spring. Read more here.